Throw-off on the back stroke was different in that the velocity of the object was invariably smaller. An object dipped in blood and thrown back, as in preparing for a blow, deposited large drops mixed with a considerable proportion of small ones. Photograph No. 41 shows this effect with a flashlight. Note of interest: The flashlight produced back-throw spots most nearly like those on the east wall of the murder room, ranging from almost 1/2" diameter to very small spots. Also note that the roundness of the drop was readily duplicated by the back motion postulated in this report and used in this experiment. The distance from the paper wall was similar to that which occurred in the bedroom. 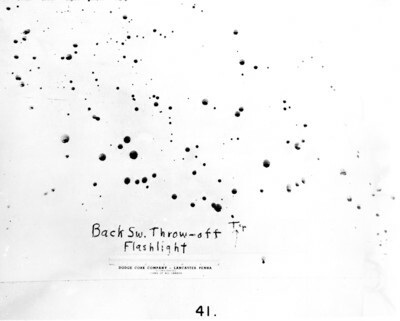 While this does not prove that a flashlight was the weapon used, it does show that an object of that general shape and size produces the results found.